The cost of unplanned downtime can be devastating for any manufacturing company, which makes preventative maintenance a hot topic at the moment. It reduces unnecessary maintenance when everything is working fine and focus your resources on repairing or replacing critical components that are nearing the end of their usable life - before they fail. Companies often fall into two camps; those that regularly maintain motors, fans, pumps etc. whether they need it or not, and others who wait for something to go wrong before they repair or replace the affected part. Although regular maintenance is better than none, both can be inneficient and waste valuable time and money. 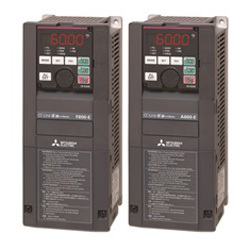 Mitsubishi Electric FR-A800 and FR-F800 a.c. Inverters can monitor variables such as output current and torque, detecting any unusual readings that may indicate a potential fault. Alternatively, if you prefer a time-based maintenance schedule, they can also log actual run hours or number of starts to make your life easier. In normal use, each conveyor uses a certain amount of current that will vary within a pre-determined range. When a fault occurs, such as an increase in the load caused by worn bearings, this can be detected through a higher output current. Conversely, cracks in the conveyor belt will cause the load to decrease (reducing the output current) - long before you actually see the problem. Mitsubishi Electric FR-A800 and FR-F800 a.c. Inverters can monitor the output current, detecting unusual readings that indicate a potential fault. Best of all, fault detection is easy. There are no programs to install, it only requires the setting of parameters and can be adjusted to meet the requirements of the system and customers’ needs. In a similar way, the relationship between speed and load characteristics (torque) during normal operation of a fan or pump can be prerecorded and compared with load characteristics during actual operation. Not only does this help detect worn components, it also aids the detection of problems such as blocked filters and pipes. The Mitsubishi Electric FR-F800 is a dedicated a.c. Inverter for fan and pump applications, with specialised functions such as the cleaning (also known as de-ragging) function, which enables forward/reverse rotation and stopping of the motor to remove dirt and foreign matter on the fan or pump impeller. Working together with the fault detection function, the increased load caused by the dirt or foreign matter can be detected, automatically starting the cleaning function when an overload is detected. If this process clears the problem, the load charateristics will return to normal levels and operation can continue. An alarm will be triggered if the problem isn't cleared and requires additional maintenance support. If you would like further information about Preventative Maintenance or Mitsubishi Electric a.c. inverters, call our Head Office Sales Department on 01254 685900. Our Technical Support Engineers or your local Field Sales Engineer will be happy to help.